The 6-3 votes follow sharply divided testimony between supporters and opponents of the plan. Portland city councilors voted late Monday night to charge consumers a nickel for every disposable shopping bag they get and to ban foam containers for food and beverages in an effort to reduce trash that pollutes waterways. The two 6-3 votes came after nearly two hours of impassioned testimony, and two years after councilors began discussing the proposals. The testimony was sharply divided, with most individuals speaking in support of the measures and most business representatives opposing them. Starting next spring, Portland will be among relatively few communities in New England with both a bag fee and a ban on the type of polystyrene foam that’s commonly used in coffee cups and take-out food containers. “I think we want to do this because Maine and Portland care about the environment,” said Councilor Jon Hinck, who voted for the measures along with Councilors Ed Suslovic, Jill Duson, David Marshall and Kevin Donoghue and Mayor Michael Brennan. 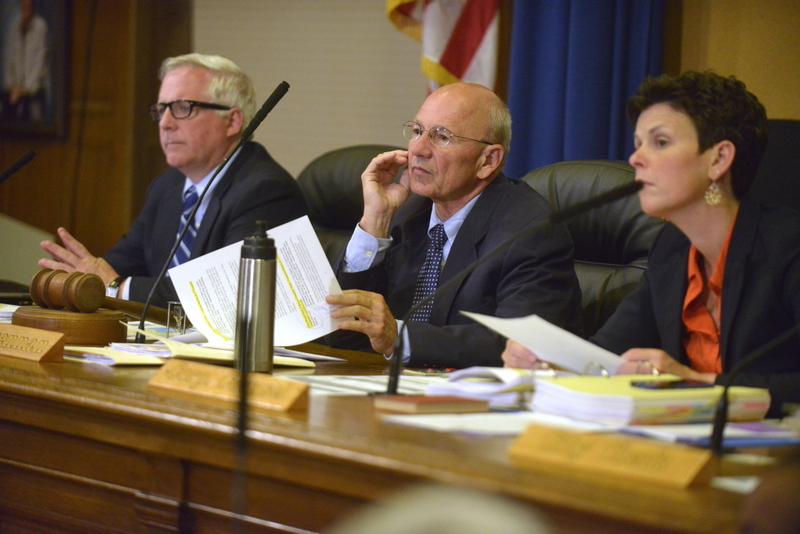 Opposing the two measures were Councilors John Coyne, Cheryl Leeman and Nick Mavodones. Coyne said he could not support another fee. Under the ban on foam containers, businesses will have until April 15, 2015, to switch their packaging. The bag fee, also effective April 15, will apply at stores where food – including milk, bread, soda and snacks – constitutes at least 2 percent of gross sales. The fee will be charged for both plastic and paper bags, with the stores keeping the money. Dry cleaners, restaurants and farmers markets will be exempt. 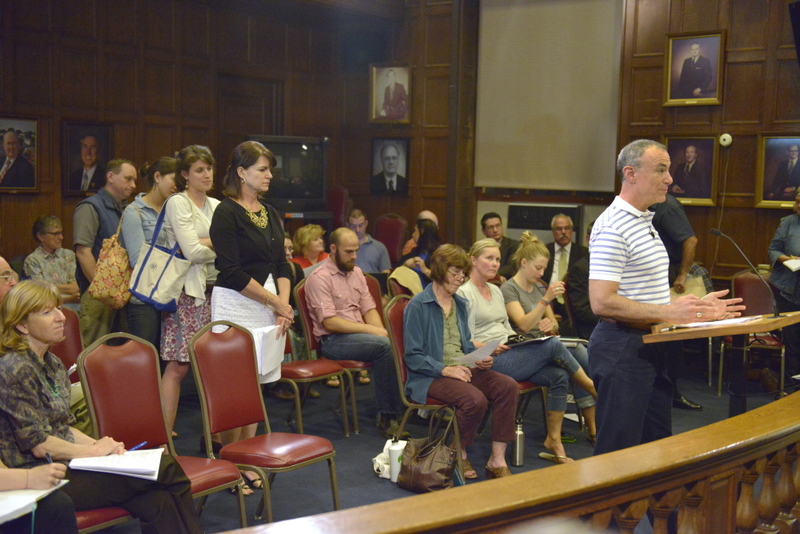 Supporters, including representatives of several environmental organizations, predicted that the ordinance would reduce the trash that ends up in Back Cove, the Fore River and Casco Bay. Plastic and polystyrene may break down into smaller pieces but they do not biodegrade, so they pose health risks to marine life. Will Everitt, a Portland resident representing Friends of Casco Bay, said it is “a rare day” when members of the organization don’t see plastic bags while boating. Everitt said that while opponents have focused on the cost to businesses and consumers, a recent study showed that Casco Bay accounts for $628 million a year in economic activity, ranging from tourism to commercial fishing. “I think it is important for us to think about what Casco Bay brings to the table,” Everitt said. 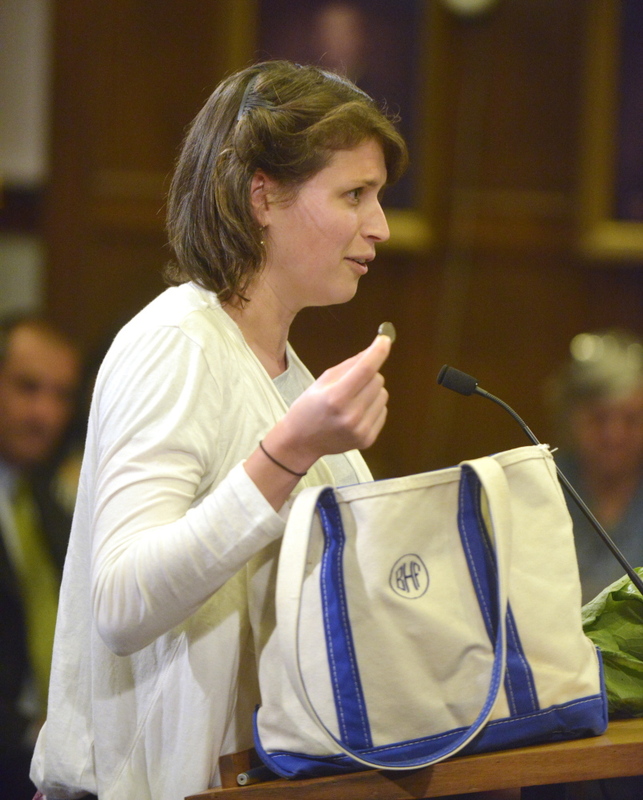 East End resident Bonnie Frye Hemphill was one of several speakers who brought in props, in her case a Maine-made reusable bag packed with everything from her purse and cellphone to a bundle of leafy greens. She said a 5-cent bag fee is affordable and fair. “Putting a price on a bag, like any other product, is common sense,” Hemphill said. Opponents described the bag fee as another tax and criticized both ordinances as inconsistent because both would exempt many sectors of the business community – including all non-food retailers, in the case of the bag fee. Andy Charles, who operates Haven’s Candies stores, called the bag fee a “double tax” because the 5 cents will be subject to the state’s sales tax. Charles called the fee just another increase in the cost of living in Portland and said it could prompt consumers to shop elsewhere. Representatives for the Portland Regional Chamber, the Retail Association of Maine, the Maine Grocers and Food Producers Association, the Maine Restaurant Association, Cumberland Farms and several small businesses also spoke against one or both of the proposals. Peter Doyle of Cumberland Avenue said Portland residents are already over-taxed and the proposals follow a 3 percent property tax increase passed by the City Council. Doyle also predicted unintended consequences, such as an increase in dog waste because people use the plastic bags to pick up after their pets. Instead, the city should take “measured, common-sense steps” such as putting lids on recycling bins to prevent trash from blowing away. More than 120 other communities across the U.S. that have banned plastic bags or imposed fees of 5 to 25 cents on them to discourage consumers from using them, according to the Surfrider Foundation, a California-based nonprofit that’s active on water quality issues. Restrictions on polystyrene foam containers are far less common but are increasing nationally. Freeport has banned foam containers since the early 1990s, although the town does not have a policy on plastic bags. Maine state government also prohibits food service vendors from using polystyrene at state-owned facilities. New York City officials also recently voted to ban foam cups and to-go containers beginning in 2015. In Massachusetts, Brookline banned both plastic bags and foam containers beginning in November, while both Somerville and Amherst – home to the University of Massachusetts’ flagship campus – began prohibiting food retailers from using polystyrene earlier this year.